This pretty bistro serves simple, seasonal food in an airy ambience. Breakfast & Lunch Mon.-Fri., Dinner nightly, Brunch Sat.-Sun. : This airy Napa Valley restaurant tries hard to match its first-class hotel surroundings. 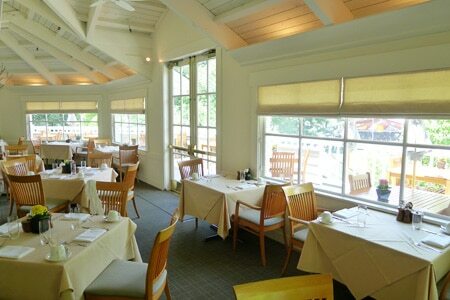 Outdoor tables enjoy a view of the croquet course, the golf course and the surrounding woods. The staff, led by chef Arturo Guzman, sweats the small stuff, from artfully arranging a bowl of fresh berries at breakfast, to adding tortilla strips to the hearty roasted tomato soup. Breakfast choices range more widely than other meals and include a variety of cold-pressed juices. A weekend brunch menu offers the best of two meals with pumpkin pancakes, corned beef hash and wild mushroom flatbread with bacon. Anchovy lovers will enjoy the Caesar salad, which features oversize croutons, large leaves of romaine and whole fish. The American lunch and dinner offerings also include sandwiches, pastas, chicken, seafood and steak, with some of the ingredients fresh from Meadowood's proprietary garden. We like the butternut squash ravioli with crispy sage leaves, though some may be put off by the overabundance of brown butter. The wine list is understandably impressive, as the Grill shares a cellar --- and a roof --- with The Restaurant at Meadowood.